Haunted by death. Beaten by life. No one escapes the pain. 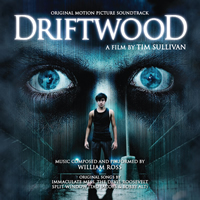 BUYSOUNDTRAX Records presents the premiere soundtrack release of DRIFTWOOD. The soundtrack features music composed & performed by William Ross (THE GAME OF THEIR LIVES, SEPTEMBER DAWN) and original songs by Immaculate Mess, The Devil Roosevelt and Split Window (Tad Jacobs & Bobby Alt) for the 2006 horror film directed & co-written by Tim Sullivan along with Chris Kobin (2001 MANIACS). William Ross is a prolific, award-winning composer and arranger whose work has spanned feature films, the recording industry and television. He has composed music for such films as TUCK EVERLASTING, MY DOG SKIP, TIN CUP, MY FELLOW AMERICANS, the IMAX film, YOUNG BLACK STALLION, HARRY POTTER & THE CHAMBER OF SECRETS, where he was adapting the musical themes of John Williams and, most recently, SEPTEMBER DAWN. Ross has orchestrated more than 100 films, including THE MATRIX RELOADED, FORREST GUMP, STUART LITTLE, THE MUMMY RETURNS, THE POLAR EXPRESS and VAN HELSING. He has also arranged for a remarkable list of artists including Barbra Streisand, Celine Dion, Josh Groban, Whitney Houston, Kenny G., Michael Jackson, David Foster, Quincy Jones and Babyface. In 2007, he was Music Director for the 79th Academy Awards Special.